R ead the papers, watch the news, and weep. Clickbait, fake news and climate change deniers given equal prominence as scientists. Turn to social media for a cat-fest-respite to find misinformation, election meddling through opaquely funded ads (allegedly), hate-filled videos and online bullying driving vulnerable young people to the brink or worse. Should we care about the media’s responsibility and balance? If we do, then in an age in which argument and polemic have become the norm, what positive steps can we take to support media we can trust? 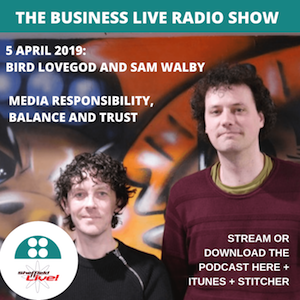 Today’s Business Live radio show features guests Sam Walby and Bird LoveGod. Sam is a director of Opus Independents, a Sheffield-based social enterprise. Opus has published Now Then (a free arts, culture and politics magazine) for a decade. Sam is also programmer and producer for The Festival of Debate, an annual series of political, social and economic events, film screenings and talks. Bird has launched EthicalMuch, a new “social network for ethically-minded people.” He’s also a columnist for The Yorkshire Post and a freelance writer for tech businesses. It’s a wide-ranging conversation about the role of media and social media today. Here’s the podcast to download or stream (also find it in iTunes here). The timings and show notes are below. 0 – 5:25 updates and introductions. 5:25 Sam Walby: at this year’s Festival of Debate, “we want people to think about what they stand for, rather than what they stand against.” The festival’s extensive programme of 60+ events features speakers including Afua Hirsch, George Monbiot, Julia Unwin, Steve Silberman and Vote Leave whistleblower Shahmir Sanni. 10:14 when there’s lots of negativity in the press and in Parliament it’s important to talk: offline and online, and with empathy. 12:20 how Now Then magazine has sustained itself over more than a decade – and the key restriction the magazine has on advertising which is as much a strength as a weakness. 16:15 will too many good deeds will break Bird’s business? 20:55 what is a good deed? Who defines it and how? 22:33 the psychology of encouraging positive behaviour. 25:15 EthicalMuch’s plans to sponsor children. 29:17 what would Bird say to anyone worried about whether EthicalMuch has a robust business plan? 31:24 executives of social media firms may be made personally liable for fines for breaches of a new “duty of care” relating to publishing harmful content online. Would that change behaviour? 36:15 Sam: Opus, Festival of Debate and Now Then have numerous social media followers. Given their willingness to share opinionated content have they experienced abuse online? How do they react to disagreement or even trolling? 39:10 Now Then is voluntarily regulated by Impress, the only independent press regulator in the UK. What does that mean in practice? If Impress were to uphold a complaint what would happen? 42:15 What is the media’s responsibility? Is it to inform or to entertain? Is a nuanced media all very boring? If someone wants to listen to or read a polemicist is that simply fine? Should the media facilitate argument? 43:11 Bird on media power and influence. 45:01 Sam: How does media “speak truth to power” once it becomes part of that power – and can it? 48:28 Sam on no-platforming. Should someone be given a speaking platform if they have views the organisers disagree with? 50:30 how listeners can contact Sam and Bird – and some calls to action. Check out The Festival of Debate, Now Then Magazine and Opus Independents.